Storm Front is the first novel introducing the wizard P.I. 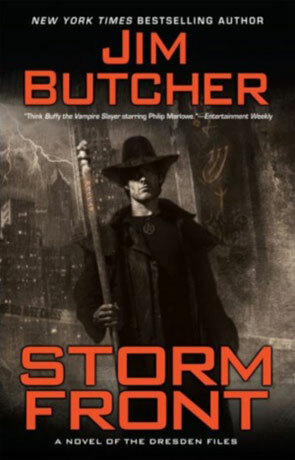 Harry Dresden to the world, a gritty urban fantasy that manages to captivate right from the start. We join Harry as he's going through a bit of a slow patch and so when the Chicago PD asks for help with a double homicide he jumps at the chance to earn some cash. At the same time he's also asked to trace a missing person and finds himself having to investigate both cases at once. I loved how the author has spent time building up a real sense of history for Dresden, it feels like you are being introduced to a story that's already been going for some time and the subtle hints into his past are perfectly played. The same is true of the larger universe too, there are no attempts to coddle the reader or explain things in too much detail, instead we are treated as adults able to form opinions, make judgements and understand that which isn't being said. As a result the minimal back story is told through effective exposition and doesn't hold up the pace in the slightest. There is a real vibrant energy to the novel and the voice projected from the pages is clear, mixing urban fantasy with hard-boiled detective fiction. The plot itself is a well written mystery with Harry trying to track down the magic wielding killer and it does keep you guessing for a while. There is no wasted space here, everything feels perfectly set and the pace is pretty fast. There are a few really nice twists in the usual urban fantasy style too, I love the way that magic interferes with anything electronic and this actually goes some way to explaining why anything electronic manages to break when placed within 5 feet of my brother (perhaps he is a latent wizard). The Character of Harry is wonderfully portrayed, with a laconic and self-depreciating sense of humour that manages to fit perfectly with a modern, world weary wizard outlook. The story itself is engaging with plenty of twists and turns while also being full of colourful characters, brought to life by the authors talent. There is also a very effective build towards the latter part of the novel, a heightening of tension which does end in quite a climactic and yet abrupt manner. I also love how Butcher manages to make Harry so much less than perfect, although he has a very strong morality he's certainly not infallible and isn't a superhero either; the author manages to highlight the humanity and mortality within this world replete with creatures of the dark. Storm Front is a perfect blend of private detective and urban fantasy, heaps of fun and irresistible from beginning to end. Written on 16th January 2012 by Ant.